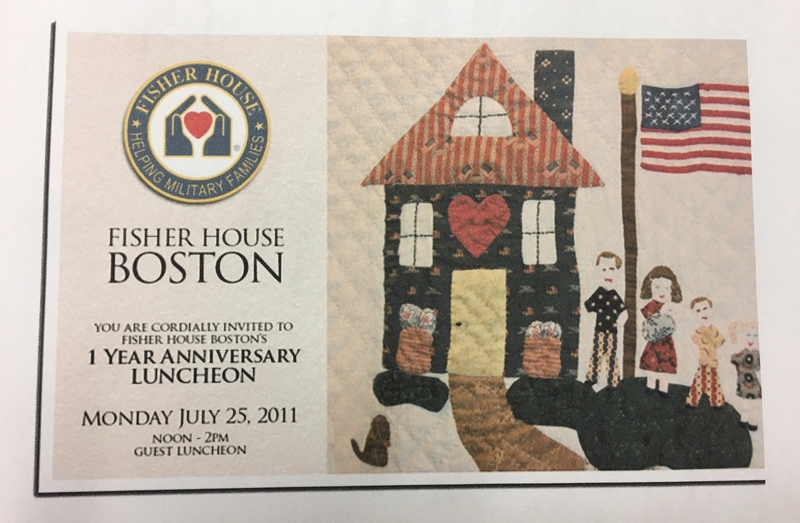 In Part 7, the God Bless America quilt was delivered to the Massachusetts Fisher House in Boston. The plan was to have a grand event and send-off, but the Director asked if Boston could have the quilt. Headquarters not only agreed, they approved. So, Milly and the children gave the quilt a memorable farewell, including singing our book for soldiers staying at the Fisher House. A month later, Beth who is the Director at the Fisher House called me. The only celebration I knew of was that Congressional Medal of Honor recipients attend the grand opening of a new Fisher House. Gulp! I was taken aback. “Beth, that is wonderful, but…” I didn’t have a chance to finish the sentence. Oh my goodness. There it was, Home Sweet Home, right on the invitation. I couldn’t wait to tell Milly. Another gulp! This was big. Much bigger than I expected. It took a while to sink in. The quilt was as important to the Fisher House as it was to Milly and to me and to the children. Milly was as surprised as I was… and just as delighted. I notified families. Many children were able to attend. We all stood in front of the quilt, in front of a big audience. Big. I gave an impromptu speech, telling the guests about the evolution of the quilt. I told them about the children singing, and how they needed more. I told them about Milly and how she made the words come alive with the quilt. You could have heard a pin drop. They wanted more. I decided to recite the words to the song and point out each part on the quilt as I said the words. I was all over the place- talking, walking and pointing. It was much the same as when I read aloud chapter books. No words were necessary from the audience, their faces said it all. Then Milly and the children sang their hearts out. Oh, how they sang! We received a huge round of applause. That broke the ice, and the thanks and handshakes and smiles exploded. A Fisher Foundation Vice President approached Milly with a handshake, pressing something into her hand. I knew exactly what was happening- she was giving Milly a Command (Challenge) Coin! I was humbled to witness this happening. I watched the ‘secret handshake’, which appears to the naked eye to be a simple exchange of respect, yet holds the surprise of the coin for the recipient. I understood. I told Milly all about Command Coins afterwards. This would mean far more to her than I realized. Her last words to me years later were about that coin (later post). The letters of thanks poured in. And then Milly became sick. Kidney failure. about our school, our towns. Everyone wanted a quilt to hang at school. The next adventure began. Stay tuned for Part 9. This entry was posted in art, Early Education, Imagination, Inspiration, military, patriotism, quilting, Singing, The Arts, wonder, young children and tagged "God Bless America", challenge coins, Fisher House, Fisher House Foundation, Imagination, Inspiration, Milly the Quilter, patriotism, quilting, young children. Bookmark the permalink. What a special event for all of you and with your excellent presentations skills, I know everyone enjoyed it. I do think you need to take all these Millie blog posts and combine them into a book one day. Thank you, Darlene. I think you’re right, and one day I will (hopefully) combine the stories into a book. Your words took me there with you, to that memorable occasion. Then the sadness of Milly’s diagnosis, even though I already knew what the end will be. Moving indeed, Jennie. And the saga continues. A wonderful narrative, Jennie. What a wonderful way to honor Millie, you, and the children. Thanks for sharing. You’re welcome, John. Glad you enjoyed this. With your book My Grl, I figured you know about Challenge Coins. That gesture to Milly was huge. Yes I did know about them. A lot of fun. What a wonderful experience for Milly. Having another quilt to do gives one reason to continue on in spite of the illness. I’m sure all of this meant so much to her. Probably more than most would realize. You do inspire. It did, Marlene. Very much so. Thank you so much. Hard to believe there are still two quilts to go in the story. I don’t know how she did it all. She did it with love. That’s all it ever takes. You are so right, Marlene! And she had plenty of love. I too agree with Darlene-this is a sweet book! This part really should have come with an advisory notice that one needed to have tissue at hand, and be prepared for tears welling up in the eyes, and huge lump in the throat! OMG! This is so touching! WOW! Oh, goosebumps are also to be expected! WOW! That must have been an amazing evening. This story is so uplifting, Jennie. Thank you for sharing it. I think Milly would feel honored. Thank you so much, Dan. I’m glad you felt uplifted. Milly must know that her stories are alive and honoring her. Dear Jennie, you brought this post to life beautifully. It was so exciting — I felt I was there. To have these memories, these milestones in your teaching career… what a wonderful thing. Hugs on the wing. Oh My Goodness, what a beautiful honour for you all, I had pinpricks of tears behind my eyelids Jenny as I felt your own emotion as you told the tale.. You told it so well I could see the Quilt, the handshake and then the children bursting into Song, And the audience sat in silence listening to every word as you explained the Quilt..
That is so nice, Sue. Thank you for your kind words. I’m so glad you ‘felt’ everything that happened. It was quite emotional. And yes, more to come! This is another wonderful post, Jennie. It just keeps getting better and better. What a wonderful honour for you, Milly and the children, Jennie. Memories to treasure for the children, for all of you. I’m sorry to hear Milly is not well, but pleased to hear there is a new project on the way. As I write each episode, I realize there are more memories than I had remembered. It really is a legacy. Thank you, Norah. I hope you enjoy the new project ahead. I’m looking forward to it, Jennie. Thank you so much, Debby. It really was like a fairy tale. Lucky me! I think you’re right that it should be a book. Oh how I wished I could have been there and hear them sing! Just reading about it gave me goosebumps! Awww… that is so nice. It was wonderful. Thanks, Sarah.